Last Updated: December 11, 2018 · Published: November 5, 2018 By: Asian Caucasian 2 Comments This post may contain affiliate links or sponsored content. It’s not exactly tropical right now, but we can dream, right? 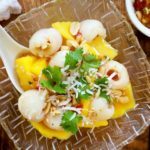 Personally, I would serve this awesome Thai Mango and Lychee Salad any time of the year, as a salad starter or for dessert! The sweet and spicy sauce is the star of this salad and hits all the right flavor notes on top of luscious mango slices and sweet lychees, crunchy peanuts and toasted coconut flakes. Pick ripe mangos (I caved and bought one of those mango slicers/pitters so I wouldn’t cut myself. They are slippery little devils! ), get some canned lychees at the Asian market, and toss in the other ingredients. So incredibly delicious! 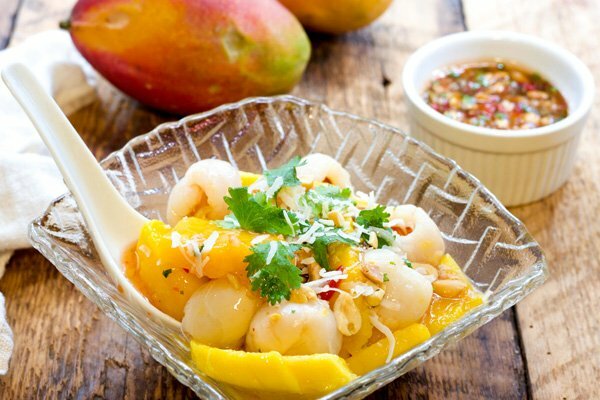 This Thai Mango and Lychee Salad has a sweet and spicy sauce that hits all of the right flavor notes! Serve this as a starter or for dessert! Peel the mango from top to bottom: Using a Y-shaped peeler, work your way around the mango, removing the skin. As you expose more pulp, use a paper towel or kitchen towel to hold the peeled mango so it doesn’t slip out of your hand. Peel away the tips. Determine the tallest line of the mango: Place the mango on the cutting board and find the side that seems the tallest—the pit will be sitting along that line. Slice in half, avoiding the pit: Holding the mango with a paper towel or kitchen towel, position the chef’s knife, aiming it at the center of the fruit; you may need to adjust the angle of the knife if you find that you hit the pit. Slice the sides off the mango, avoiding the pit. Cut around the pit: Holding the fruit vertically, trim the remaining flesh off the pit. Slice the cut halves: Finish the mango by slicing the pieces horizontally into smaller wedges. Make sure to pick ripe (but not overripe) mangos. 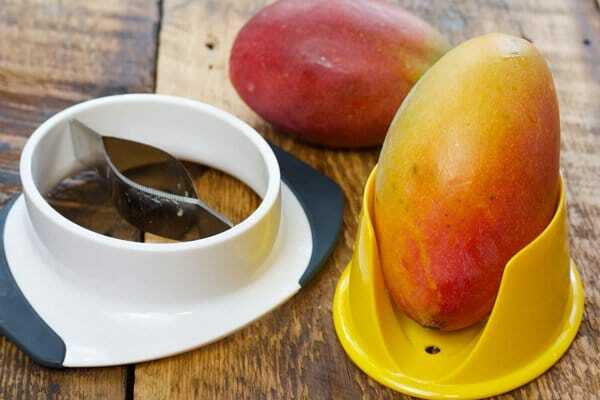 Get yourself one of these mango-pitting gadgets that keeps you from slicing your finger open! SO worth it! 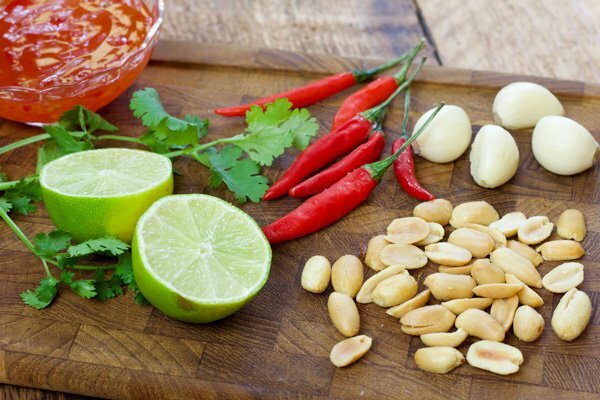 The perfect ingredients for the Thai Sweet and Spicy Sauce. Easy to make and you can use it on so many things! Look at those colors! Wow! 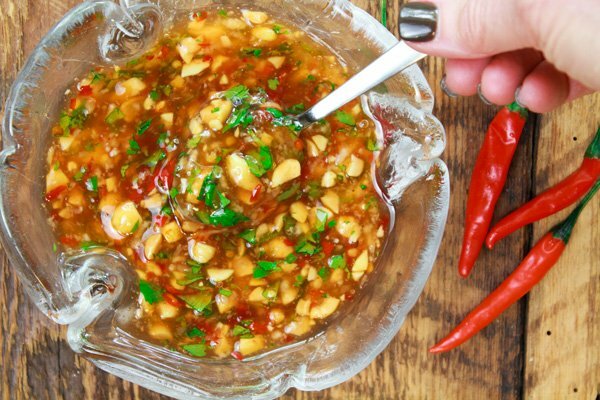 This Thai Sweet and Spicy Sauce is SO good on this salad! 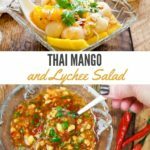 I know this will be a year-round treat for you once you taste the amazing flavors in this Thai Mango and Lychee Salad. Thinly slice the mangos and place them in a large mixing bowl. Drain the can of lychees and add them to the bowl. Set aside. In a small mixing bowl, combine all of the ingredients and stir well. 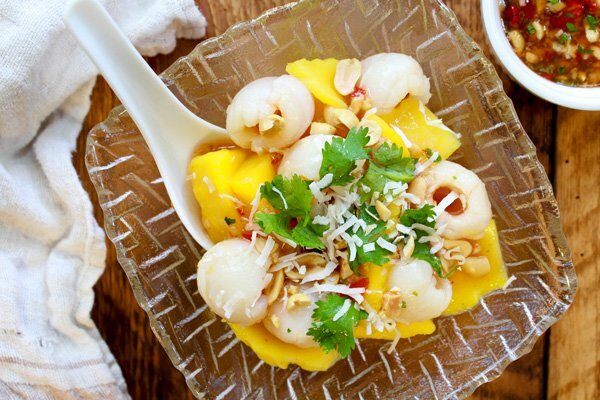 Toss the Thai sauce into the mango and lychees, coating well. With each serving, garnish with toasted coconut flakes and sprinkles of peanuts. 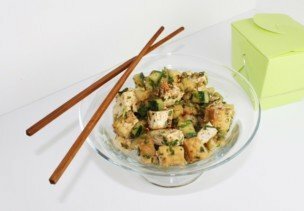 If you liked this recipe, try our Spicy Asian Tofu Salad. Thanks, Shannon! Me too! I love this light mango salad that’s perfect all year round! It may not be tropical outside, but this recipe makes me feel warm! I’ll eat mangos any time of the year!